Welcome to Classic Road and Track, your home for classic sports, rally and racing cars from the golden era of motor sport. With a passion for classic cars that spans a collective 45 years, Mark and David have the expertise, knowledge and contacts to source the finest examples of the cars our clients desire. Whether you are looking for a particular car to purchase or are thinking of selling your special motor car, we would be very interested in hearing from you. We aim to provide the best service available, discretion and confidentiality is always of the utmost importance. 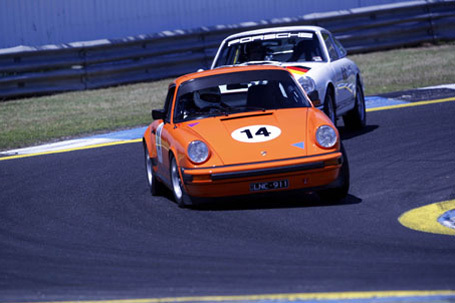 Australian Touring Car Legend John Bowe recently drove our 911ST replica in the 2010 Phillip Island Festival of Motor Sport. The car was entered in the over 3lt category of Historic Touring Cars and was pitted against the big Mustangs and Aussie Toranas. Some fantastic driving resulted in a cracking lap time of 1:52.51. That was .05 seconds quicker than that of the race winning Mustang. Not bad for a 2.3lt 911!